Poinciana Yacht and Racquet is a quiet and exlcusive development of condominiums that are located in Sunny Isles Beach. 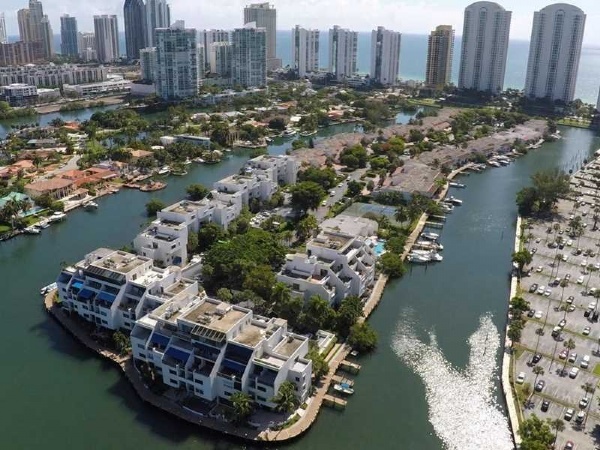 The neighborhood is both waterfront condominiums and townhomes and have private dockage to take advantage of the deep water access and the intracoastal waterway. The area is completely gated and offers residents two pools, tennis courts, gym, and clubhouse. It is walking distance to the stunning Sunny Isles Beaches and is conveniently located to convenience stores, gourmet and casual dining, nightlife, and airports. Miami Beach is a short drive away, as is Downtown Miami, and the Sunny Isles neighborhood is growing in prestige as some of the most sought after designers and architects are setting their sites on its' development. Poinciana Island and Racquet Club is like Williams Island in Aventura in that it is comprised of a number of structures and is gated with water access and tennis being a focal point of the lifestyle within the gates. Residences are usually under one million and are in a wide variety of floorplans offering townhomes and condos. Parking is covered and private and the community is intimate. Properties in the Poinciana Island and Yacht Club are coveted due to the importance placed on an active lifestyle and also due to the incredible natural waterfront appointment.